Ben Frempah included on the bench and introduced as a late substitute for his Wanderers debut having recently been signed on a non-contract basis. "It is really hard to take. I would take a 1-0 with a rubbish performance all day but deep down I won't because I put my name to that performance. "I can't ask the boys to give me any more than they gave here and to come away with nothing is shocking. They stuck their chance in and we had a glorious chance [Kashket in the second half] and the keeper knew nothing about it but the stats are in our favour. It is just really tough to take. I have said to the boys I put my name to that performance but you have to do that for five games now. "That desire, that workrate. If they give that for the next five games, teams will not live with them. People questioned our fight at the start of the season. The one thing we have is fight and it is that bit of luck we are missing at the moment." On the penalty claim in the second half when Adebayo Akinfenwa's shot appeared to strike the hand of a Charlton defender. 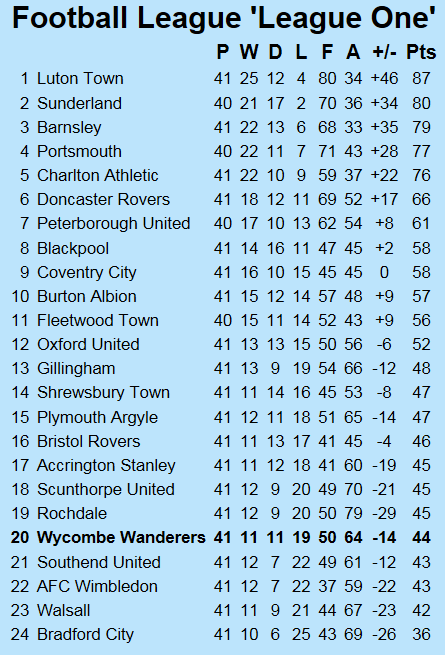 Wanderers down one place to one place and one point above the relegation zone with five games remaining. Rochdale's victory at Accrington lifted them out the relegation and above the Wanderers. 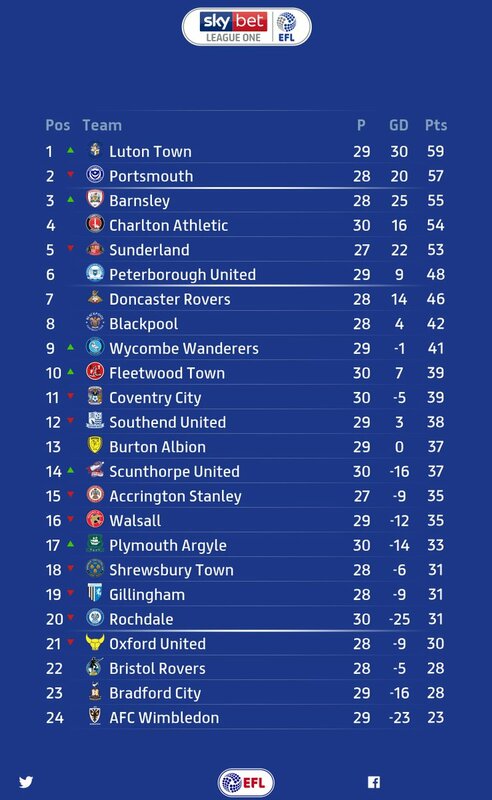 Wycombe visit 21st placed Southend on Saturday (13th April 2019) knowing that defeat would drop Gareth Ainsworth's side into the bottom four since August 2018 (4 games played). Three points added in 13 games! No wins - five straight defeats.